Volkswagan introduced light duty forward control vehicles for the general public with the Type-2 Transporter, first produced as the 1950 model. Over the next few years VW introduced variations on its "microbus" including the rear-engined Type-2 pickup. By 1957 US car manufacturers were developing prototype forward control vehicles, the first released in late 1960 as 1961 models. While all of the US forward control vehicles reflected elements of VW styling, only Chevrolet accepted the rear engine challenge. All manufacturers marketed FC pickups for light duty commercial service, and all but Willys also produced FC vans for delievery, passenger and recreational uses. The following descriptions focus on the FC pickups presented in order of their market appearance. The VW FC vehicle first marketed in 1950 was the Type-2 (T1 -as later designated) Transporter minivan, with the rear-engined FC pick-up coming in August 1952. These vehicles were recognized for their efficient use of space and comfortable ride afforded by a four wheel independent suspension, though considered under-powered by later standards for their flat 4-cylinder 40HP engine. In the pick-up, VW placed a level cargo bed above the engine with hinged walls on all sides that could be folded down for unimpeded loading access. Under the bed forward of the engine was a locker with 23 cu-ft of storage space (a feature originally intended for the Corvair Loadside). 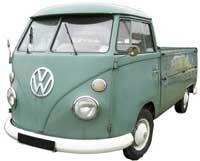 Unlike the US made vehicles that were to follow, VW also offered a double cab pickup that seated 6 passengers. Although the Type-2 pickup was never as popular in the US as the VW Kombi camper and microbus vans, they were more popular in other parts of the world, averaging about 20% of Transporter production from 1952-1967. The VW pickup was a casuality of the "Chicken War" tariff battle between the US and the European Economic Community,and VW did not pursue marketing of the pickup in the US after 1967, shifting its attention to the modified Type-2 (T2) vans introduced at that time. Willys-Overland was at the vanguard of US FC light duty truck manufacturers. The Keiser-owned Willys company (in Toledo, Ohio) introduced in November 1956 the 3/4 ton FC-150 with a cab-over-engine design. Built on the Jeep CJ-5 chassis with a 'Hurricane' 4-cylinder, 132 cid, engine, the FC-150 had a narrow 81-inch wheelbase, ultimately the smallest wheelbase of all the FC trucks, 4-wheel drive FC-150, and tight 18 foot turning radius. The FC-150 ('150' for its 150 in length, almost) had a larger cargo capacity than a conventional jeep, through much smaller than that of the VW and subsequent American-made FC pickups. The standard F-150 was marketed primarily for light-duty commercial, farm and maintenance applications, but the chasis was widely customized for towing, dumping, trenching and plowing. A FC passenger vehicle ('Communter') was prototyped but never put into production; however, for heavy duty work Willys introduced the 1-ton FC-170 in early 1957. Approximately 15,000 FC-150s were sold between 1957-1963. Both models were maintained through company rebranding as Kaiser-Jeep in 1963, but sales tailed off significantly in the final years and production ended with the 1966 models. The Corvair 95 incorporated VW design more than any other US manufactured FC pickup, including the rear located engine, four wheel independent and swing-axle rear suspension. Indeed, prototype FC suspensions and powertrains were reportedly installed on VW Kombi buses. However, Chevy ante-upped the engine to six cylinders and 80HP, and used coil spring suspension all the way around. With no need to tuck the engine between front seats, Corvair 95 pickups had a roomier cab than other US manufactured FCs, and the well-balanced front-rear weight distribution and suspension produced superior handling and traction. In part due to the height and width proportioning and biconcave contour line, the Corvair 95's styling is considered to be more distinctive than that of the Econoline and Dodge A100. 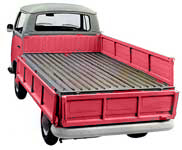 The corvair pickups also had a larger cargo area and payload than US competitors; however, the decision to elevate the bed only over the engine compartment created an uneven cargo floor. The frontward cargo area was exceptionally deep but inconvenient to access, especially from the tailgate of the Loadside pickup. This dilemma was resolved in the Rampside model by the presence of the side ramp gate. But the market did not respond well to these design features and higher price. Coupled with its cargo loading issues, the Loadside folded in 1962 with only two production years and fewer than 3000 delivered. The Rampside survived longer, but even with its distinctive side gate, sales could not be ramped-up sufficiently to extend production beyond 1964. Also in 1961 Ford added its Econoline series to the burgening field of FC vehicles. Shunning a rear engine and following instead Willys' lead, Ford situated the engine over the front axle and between the cab bucket seats. The Econoline utlized key design elements and mechanical systems of the highly successsful Ford Falcon; however, creature comforts were not a high priotity. Unibody construction saved weight, as did absence of inner body panels. The cab is generally considered to be tight and unlike the coil-springed independent suspension of the Corvair-95, leaf springs yielded a less passeneger-friendly ride. 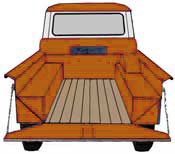 Although the payload capacity and volume of the Econoline was less than that of the Rampside (and Loadside), the rear bed was flat and fully accessible through the rear gate. Loss of effective payload capacity was due to a 165 lb ballast installed over the rear axle to improve front-rear weight distribution and rear wheel traction. Nevetheless, the cost-effective utilitarian design of the Econoline pickup found enough market to sustain production through 1967, three years after the rampside left the field. Also apparently leary of public acceptance of rear-engined utility vehicles, Dodge joined Ford and Willys (Kaiser-Jeep by the time) with a cab-over FC design. Since the Rampside folded in 1964 and VW and Willys pickups were fading fast, the new Dodge A100 entered the scene against only the Econoline for the light duty contractor and commercial delivery market. The A100 was significantly wider and taller than the Corvair-95, and exceeded it and the Econoline in payoad. While the styling was inelegant with a fascia distinctive only for the large "dish plate" headlight bezels, Chrysler found success by upping the engine ante with a standard Mopar 170 cu-in inline-six, 225 cu-in option, and even larger V8s available later on. Dodge clearly understood that pickup owners liked power under the hood (or between the seats, as it were), inspiring Bill "Maverick" Golden's "Little Red Wagon", powered with a 426 cu-in Hemi Charger -- a real standup pickup. 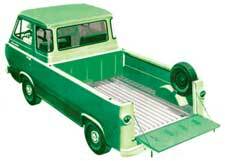 When the wheelbase of the A series vans was increased to 108 inches in 1967, the pickup was left unchanged. In total production the A100 was the most successful of the FC vehicles, with pickups representing approximately 30%. 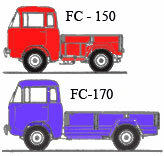 Nevertheless, the FC light duty pickup trucks passed into history when A100 production ended in 1970. Wheelbase: 94.5" 81" 95" 90" 90"
Cargo area: 102.4" x 61.8" 105" x 43.7" 74.3" x 58.3" 85.9" x 63" 84" x 66"
Overall length: 169.3" 147.5" 179.7" 168.4" 161.3"
Overall Width: 68.9" 74.4" 70" 72.5" 76"
Height 75.6" 78" 70" 77.6" 78"
Loading height, Rear: 38.6" 25" 29.5" 26.2" 32"
Ground clearance 9.4" 8" 6.5" 6.2" 7"
Why did none of the American-made FC pickups succeed? Novelty, competition with conventional pickups; cost; a limited commercial fleet market; encroaching competition from Asian small pickups; and unwillingness of the auto manufacturers to invest further in a vehicle line lacking a defined market. Yet all these vehicles remain prized by collectors and distinctive additions at auto shows.